Got a great review for all of you today from my guest reviewer Sara Miller. Here is what she has to say about the spices and rubs from Spiceologist. Spiceologist was co-founded by Pete Taylor and Heather Scholten in May 2013. Pete, an executive chef by trade, and Heather, the food blogger behind Farmgirl Gourmet are both extremely passionate about spice and flavor, so they decided to create their very own spice company. In order to make some of this possible, they joined kickstarter, where many people were inspired to invest towards Spiceologist’s company. All spice blends are 100% natural (no msg, no artificial ingredients, no preservatives). They are also gluten free, dairy free, soy free and blended with the freshest spices known to man. Each blend has many different uses and takes the guess-work out of “what’s for dinner”. Simply open the jar, sprinkle it on and grill, smoke or bake. 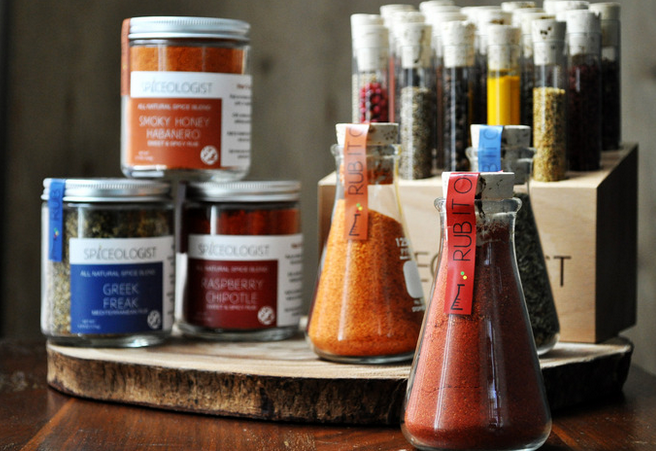 Spiceologist has a wide range of spices such as Chiles, baking spices, ground/powders, herbs, salts and whole spices. “If you like cooking “outside the box,” you’ll love our rubs…rim your margarita glass with our Chile Margarita blend, add a pinch of our Raspberry Chipotle blend to brownie batter, make some Cowboy Crust spiced cashews…inspired deliciousness at its best. For a full rub guide (how to use Spiceologist’s rubs and blends, simply visit their kickstarter page. 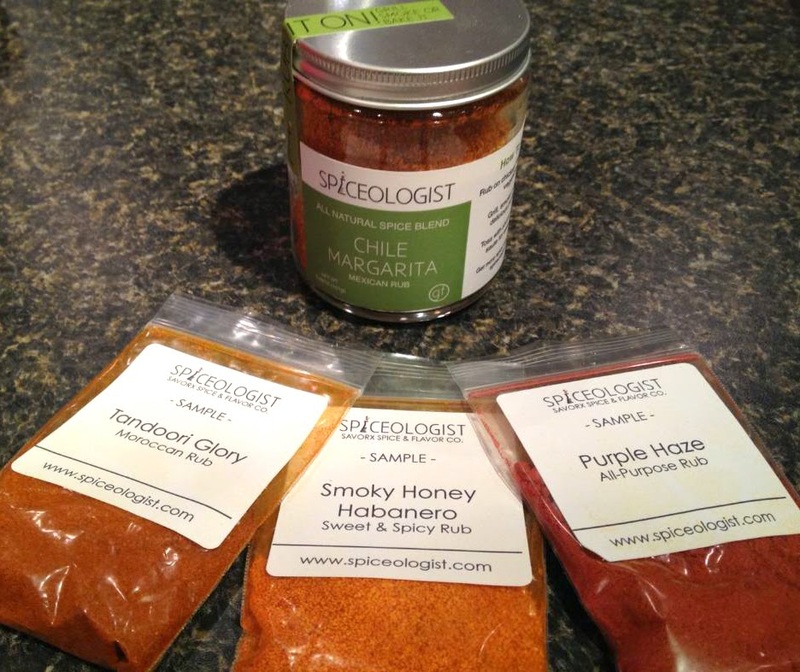 Spiceologist was nice enough to send me four different spice blends and rubs to try: Chile Margarita, Tandoori Glory, Smokey Honey Habanero and Purple Haze. Each spice and blend jar costs about $11, and they are definitely worth the price. When Derek and I first opened up the spices, we knew they were fresh based off of their smell. The Chile Margarita smells like someone just cut open a fresh lime. 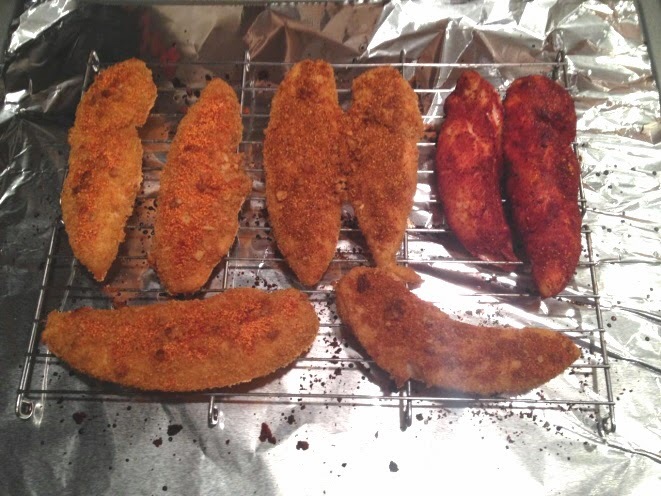 My boyfriend loves to cook and decided to make chicken tenderloins. He used Purple Haze, Smokey Honey Habanero and Chile Margarita. Now one thing you should know about me is that I am a condiment queen, however the spices and rubs we used were flavorful enough, that I didn’t need to use condiments. For people who like spicy foods, Smokey Honey Habanero has a sweet flavor with the right amount of kick. I cannot wait to try all of Spiceologist’s blends and rubs! Looking for a gift for your favorite food lover? Looking for something to get your newlyweds? What about a housewarming gift? Spiceologist will make the perfect gift for the before-mentioned questions! Spiceologist even has gift sets available (Meat Trio, Bird Trio, Fish Trio, etc). Thanks to Spiceologist, I never have to eat dull food again. Have fun with cooking again by investing in your own blends and rubs. You won’t be disappointed! Disclosure: Sara Miller was provided samples of the products being reviewed in this post. No monetary compensation was received. Sara's opinion, thoughts and ideas are 100% unbiased and her own. I have heard of Spiceologist, but have not yet tried their spices. They certainly sound fresh and unique. I shall have to visit Kickstarter and study the spice blends available.